This TEC Controller Evaluation Kit TECEV-103 can be used for evaluating our TECA1 series TEC controllers conveniently. 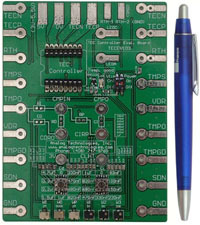 It is worth noting that the evaluation board comes with a tunable compensation network which can be tuned easily for matching the characteristics of the users' thermal loads, minimizing the time takes for the target temperature to reach the desired value and stabilizing the target temperature within a tight tolerance from the setpoint temperature. It is 100 % lead (Pb)-free and RoHS compliant.